Now I want to try and answer a few questions about the care and feeding of your new Sphynx cat or kitten. MYTH: Sphynx are hairless cats, so they do not require much grooming. FACT: The above statement is not true! You may not have cat hair on everything that you own, but there is still a great deal of care and cleaning involved in keeping your cat healthy and well groomed. 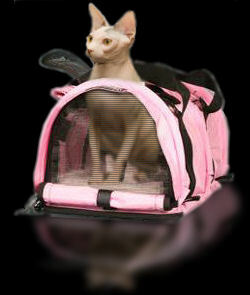 NOTE: Even though Sphynx cats are hairless, that does not mean they are hypo-allergenic. Some people with allergies to cat dander or cat hair may NOT have a reaction to them, however if they are allergic to cat saliva they could still have a reaction. Even though these cats are hairless, they lick and groom themselves like any other cat would. Cats in general do not usually like water, so bathing is best started early in life to get your new baby used to being bathed. Some cats do not mind bath time while others learn to tolerate their weekly cleaning. Try giving your cat or kitten treats after their bath, this will help them associate their bath with a reward. Sphynx require bathing and grooming on a regular basis to remove excessive oils that build up on their skin, inside their ears, and around their nail beds. My cats and kittens are bathed weekly and that is what we recommend for you to do as well. We use HyLyt shampoo. This is a ph balanced shampoo specifically designed for animals. 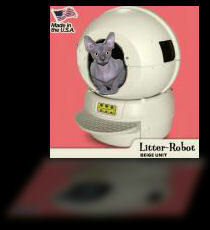 This product should be available from your vet, or it may be found at various pet supply companies on line. If you need help locating this or any other products recommended, please don't hesitate to ask us. 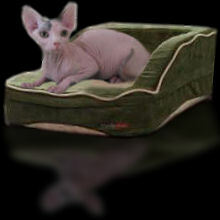 We have added images for most of the products that we use to help ensure you obtain the correct products for your new Sphynx. When it comes to removing the waxy build-up around the nail beds, we find it helps to rub the paws and nails with mineral oil prior to bathing. This seems to help loosen the wax and make it more easily removed with a soft wash cloth and warm water. Now on to some useful ear cleaning information and techniques that may help you clean your new kitten's ears. I have discovered that it is pretty easy to keep the kitten wrapped up in a towel after their bath in order to help facilitate the ear cleaning process. We use a Malaseb Flush ear cleanser with cotton balls and Q-tips. Be careful not to get an excessive amount of fluid in the kitten's ears as they can't evacuate the fluid by shaking their head like dogs are able to do. We use cotton balls that are moistened to clean the inside upper portion of the ears. The Q-tips with a minimal amount of cleaner can be used to get down inside of the ears. Do not insert the Q-tips in too deeply, as this may cause damage to their eardrums. Carefully clean only the areas where you can see the waxy build-up. Since Sphynx do not have eyelashes like other cats, they can have some dirt accumulate around their eyes as well. This should be easily removed during their bath using a soft cloth and warm water. If you have a stubborn little crease that doesn't seem to come clean, try using a Q-tip moistened with warm water, being careful as to hold their head very still, so that you do not injure their eyes. Do not use baby wipes as this may cause irritation and damage to their eyes. NOTE: When bathing always be sure to have their towel ready nearby to prevent them from getting chilled after removing them from their warm bath. Nail trimming is important for your cat's health. A cat's nails are retractable and tend to be more brittle than dogs. Often cat's nails will break off when they get too long, and they also tend to do more damage to people and furniture. We recommend that you trim your cat's nails once a week. We usually trim our cat's nails while we are cleaning the waxy build up around their nail beds after bath time. With white or clear nails you can see where the "quick" or blood vessel inside of the nail ends. This helps determine the nail portion which can be safely trimmed. However if your pet has pigmented nails you'll want to be careful and trim off just a little at the tips. Clipping your cat's nails once weekly helps keep the quick short, and keeps nail trimming easy and safe. When you first begin trimming your cat's nails you will want to have some treats handy to reward them afterwards. Giving them a treat after their nail clipping will again make them associate nail clipping with something rewarding. If you do happen to cut your cat's nail too close to the quick and it begins to bleed there are several products that you can use to quickly stop the bleeding. Always have some styptic pads or styptic swabs on hand just in case you do make this mistake. This may sting a little, so you may also want to try some corn starch to stop the bleeding. Please note that our sales contracts include a no-declaw clause. Because sphinx cats are hairless, their metabolism is much higher than that of regular haired cats. Because of their higher metabolism, they eat more often than "regular cats" do. 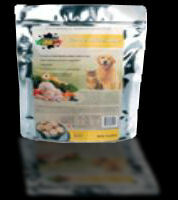 We free feed several different brands of grain free and all natural premium dry cat foods. We leave the dry food down at all times so they can eat whenever they need to. 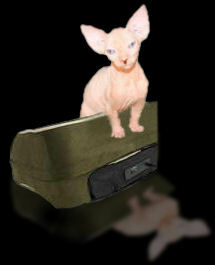 Sphynx cats will eat not only when they feel hungry, but also to regulate their own body temperature and metabolism. When our kittens are first weaned they are started on Royal Canin Babycat 34/ Starter food. This is a very small kibble specially designed for your kitten's milk teeth. It is also very high in protein (34%) for those active little kittens running around everywhere throughout our home. As our kittens grow and their adult teeth start to come in, we then start to feed several different types of dry food in order to keep our cats from becoming finicky eaters and having other digestive issues as they get older. Below are several brands of food that we use: Core Wellness, Eagle Pack Holistic Select, California Naturals, Evo Ancestral Diet, Solid Gold Indigo Moon, and Taste of the Wild. We also use Missing Link Feline Formula to ensure that our cats and kittens are getting the correct nutritional supplements. foods over the years, but we want to mention a few of our favorites: Wellness Kitten, Pro Plan, Natural Balance grain free, and BFF grain free. Although these are the brands that we have chosen for our cats, there are many others that we have tried and would recommend, keep in mind that it has to be palatable to your particular kitten. We strive to buy foods that are fit for human consumption and processed at human processing facilities, as our cats are not only our pets they are our family. frozen and serve. 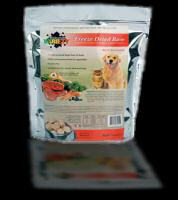 Nature's Variety makes either a beef or chicken medallion that is available at most natural pet food stores. These we offer, but not all of the cats will eat them, so it is not our main stable. 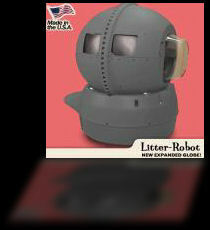 As far as litter goes, we have used the Ever Clean Ever Fresh Litter, which is a bit more expensive, and they usually don't offer any coupons, so we usually use World's Best. So now you think that you are ready for your new cat or kitten to come home. Well here are a few things that may help make your kitten more comfortable. to go to a nice warm place when they feel that they need to. I do not use sweaters on my cats, as they can't remove them if they are too warm, but they can get out of their beds whenever they want to. 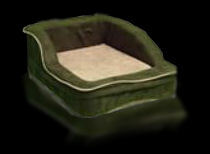 I prefer the Dolce Vita heated beds. They are very nice and easily washed, because they have fully removable covers. you try to clean them. could use a little help from you. carpet if you do not want them to claw your carpeting. 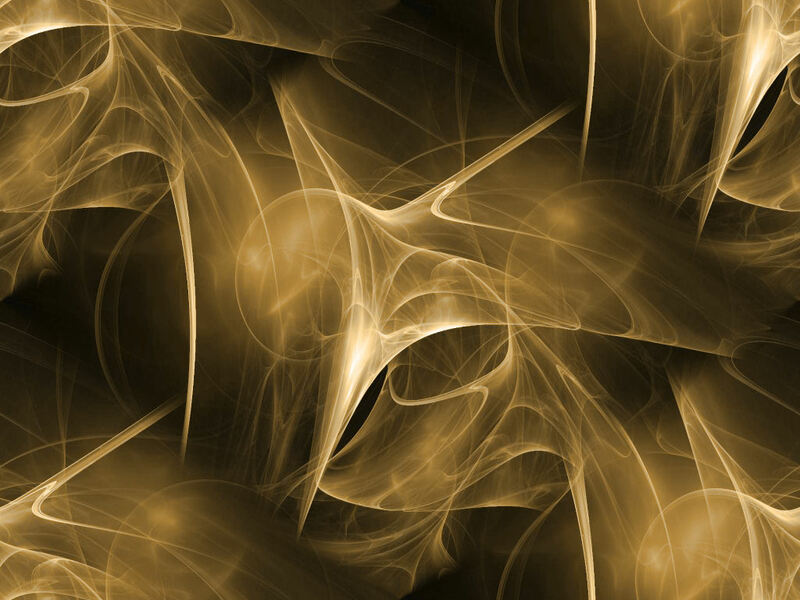 appointments and if other travel needs arise. 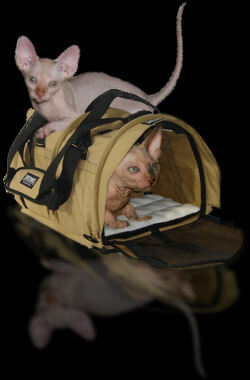 We use and recommend the Sturdi-Products pet carriers as pictured below. They are designed to fit comfortably underneath of the seat on airplanes, and they are easily disassembled for washing.